Though Eucharistic language permeates the New Testament from start to finish, there are only a few passages which deal directly with the Last Supper. The specific treatments of the Last Supper are found in the three synoptic Gospels and in Paul’s first letter to the Corinthians. A compare and contrast study of the separate accounts is quite involved, as there are many points of contrast. But on the comparison side it is interesting to note that the only actions and words identical in all of the institution accounts (i.e., those accounts which deal with the institution of the sacrament itself: Matthew, Mark, Luke, and Paul), are: Jesus took bread, broke it, and said: “This is my body.” The accounts also include Christ taking the cup, but the interpretation of the meaning of the cup varies from one account to the other. This article will highlight and discuss some of the major differences between the New Testament accounts of the Lord’s Supper using five headings representing the different textual witnesses beginning with Paul and ending with John. The final section will contain an interpretation of the findings within each account in order to discover what differences in meaning, emphasis, and applications of the institution of the Last Supper exist between the accounts. Paul discusses the Eucharist in two sections of First Corinthians: 1Cor 10:14-22, and 1Cor 11:17-34; the latter section deals directly with the institution of the Lord’s Supper. Paul’s account is unique in that he is the first of the New Testament writers to discuss the Eucharist liturgical practice as he received it during his time in Antioch around the early 40’s AD. It is a fascinating look into the early Eucharist tradition of Antioch and was likely the one Paul established throughout the empire during his missionary activities. The actual words of institution found in 1Cor 11:23-26 are nearly identical in Luke’s account (Luke 22:19-20). For this reason many consider Paul/Luke to represent a particular tradition in early liturgical development. One of the key similarities found in Paul/Luke is the use of atonement language with the bread (Mark and Matthew use this language specifically with the cup only). In Paul/Luke the bread is presented as being given “for you,” a phrase wholly lacking from Mark’s and Matthew’s accounts of the presentation of the bread. The Mark/Matthew tradition reserves this language for the cup and use the phrase, “which is poured out for many.” This different phrasing—“for many,” rather than “for you”—is evidence that the Mark/Matthew account is more primitive than the Paul/Luke account (Kodell, 76). Two important differences between Paul and Luke consist of an omission and an addition. Both texts contain the words, “This cup is the new covenant in my blood,” however the phrase, “which is poured out for you,” is missing from Paul’s version (Luke 22:20 and 1Cor 11:25). Instead, Paul includes the phrase, “Do this, as often as you drink it, in remembrance of me.” Thus Paul includes two “remembrance” phrases whereas Luke lists only one. In addition, Paul closes the section saying, “For as often as you eat this bread and drink this cup you proclaim the Lord’s death until he comes” (v.26). Paul adds this interpretation of the preceding admonition in order to emphasize what it means to “remember” the Lord through the Eucharist. Eucharistic themes are found throughout Mark’s gospel. Mark includes two feeding stories, one in 6:32-44 and the other in 8:1-10, which introduce the language and meaning of the institution later revealed at the Last Supper in chapter 14. In the second feeding story, the actual words in the text say that Jesus “took,” “gave thanks,” “broke,” and “gave” the bread, which is recalled in Mark’s telling of the Supper account. This second feeding story appears only in Mark and Matthew’s account and contains an important word which is not found in the first feeding account (which is present in all four gospel accounts). In the first feeding account Jesus “blessed” (eulogesen) the loaves and fish, whereas in the second account Jesus “gave thanks” (eucharistesas) for them. This special usage of “gave thanks,” or “eucharistesas,” is an important addition for Mark’s purposes in presenting the origins of the Eucharist tradition. Mark also introduces the cup prior to the Supper narrative in Jesus’ exchange with James and John concerning their desire to sit at His right and left side in Glory. Jesus’ response reveals the meaning of the cup at the Last Supper saying, “Are you able to drink the cup that I drink, or to be baptized with the baptism with which I am baptized?” Later when Mark pens the institution of the Supper his audience’s attention is drawn back to this episode and are reminded of what it means to partake of the Eucharistic wine (14:24), that is—to share in the life and death of Christ, both his glory and his sufferings. As noted above, there is a clear indebtedness in the Last Supper narrative found between Matthew and Mark. Many scholars place the authorship of Matthew at some time within the 80’s, just after the writing of Mark and contemporary with the writing of Luke. Though Matthew and Mark’s accounts are nearly identical in both words and themes, there are nuances in Matthew’s account which reveal particular elements of concern. A constant theme for Matthew is that of Christ’s mercy and forgiveness. This theme runs deep in Matthew’s feeding accounts. For example, immediately preceding the feeding of the four thousand Matthew tells of the “lame, the maimed, the blind, the dumb, and many others” being laid at Jesus’ feet, “and he healed them.” The feeding stories are used to demonstrate Christ’s compassionate healing ministry. As noted by Jerome Kodell, “In Matthew’s theology, the Eucharistic feeding is also not only nourishing but in a special way healing. At the Last Supper this will center on the ‘inner healing’ of forgiveness (26:28)” (Kodell, 97). Matthew even expands the number of people fed in both feeding stories to include women and children to the 4 and 5 thousand men (14:44; 15:38). But Matthew’s stress on Christ’s compassion for all is apparent in the Last Supper account when compared with Mark. Two significant additions are made in reference to the cup. Following Mark, Matthew has Jesus giving thanks and then giving the cup to his disciples, but adds: “Drink of it, all of you.” This addition is followed by the shared verse, “This is my blood of the covenant, which is poured out for many,” with another Matthian addition, “for the forgiveness of sins” (26:27-28). These additions serve as a challenge to Matthew’s audience to view the Eucharist as an event of forgiveness that all are invited too, hence there is no room for claiming that Jesus was discriminatory in those he called as disciples (particularly if one considers that this invitation was extended to Judas as well). We’ve discussed a bit about Luke’s account already, how he tracks with Paul and how he differs with Mark/Matthew; however, there are some additional interesting points in Luke’s account worthy of further examination. Luke has a much more abundant supply of meal stories than Mark and Matthew (at least one per chapter), his Supper has two cups, he practically omits the doctrine of expiatory suffering and death, and follows the Mark/Matthew account on most every other point but chooses to follow the same tradition as Paul on the actual institution account. The meals of Jesus serve as a major theme for Luke in stressing the view that Jesus’ ministry was a proclamation of life to all people—even tax collectors and sinners; something wholly inadmissible to the Judaic ethos of his day. Paul S. Minear comments that in Luke’s gospel, “The table becomes a place where human need meets divine grace.” The Last Supper is a culmination of all the preceding meals and is understood in their light, which helps explain why Luke’s Supper narrative is nearly twice as long as the other Gospel accounts. Luke’s Supper account emphasizes the anticipation of Christ’s suffering; the Supper is an intimate prelude to the time in which he will share this same meal again with his disciples in his kingdom. As noted by Kodell, “For Luke, this means both in the life of the Church (7:28) and in the heavenly banquet (13:28-29)” (Kodell, 115). John does not present a Eucharistic institution narrative at the Last Supper. Interestingly, neither does he presents a command to baptize and offers no baptismal ritual. These facts notwithstanding, John’s gospel is perhaps the richest of the “sacramental” books in the New Testament; rich in Eucharistic and baptismal themes. This is due in large part to John’s style of relating all doctrine to the incarnation. Thus, he approaches the Eucharist not as a rite focusing on the remembrance of Christ’s death, but rather in terms of food and drink for eternal life. The Eucharist is, for John, connected to the entirety of Christ’s life and not only as a specific institution (though he does not deny the institution). John uses the most radical language possible in presenting the Eucharist as the very life of Christ as seen in the 6th chapter where Jesus commands his true disciples to eat his flesh and drink his blood. John seems much less concerned with presenting the Eucharist as a community event. According to some scholars, this is likely due to late authorship of his gospel (probably in the 80’s or 90’s) when the institution of the Supper would have been well established in the Church communities and in little need of textual rehearsal. However, many have found institution parallels in John’s 6th chapter when Jesus calls himself the “bread of life” (v.35) and says “The bread which I shall give for the life of the world is my flesh” (v.51), which closely aligns with the Lucan formula in Luke 22:19. The inclusion of the strong language in this chapter is thought to be John’s way of combating the popular teaching of the Docetists who insisted that Jesus lacked a physical body. By including this occasion of Christ commanding the crowds to eat his flesh and drink his blood, John helped to continue the offense of the incarnation, denying the opportunity to interpret the Eucharistic elements as metaphoric. John leaves no room for alternate interpretations of the relationship between faith and the literal eating and drinking of Christ’s body and blood in the latter part of the chapter: Jesus says, “everyone who sees the Son and believes in him should have eternal life; and I will raise him up at the last day” (v.40), John then repeats this formula replacing the first part of the text with, “he who eats my flesh and drinks my blood should have everlasting life…” (v.54). Beginning again with Paul, the emphasis on the Eucharist as communion meal dealt with a specific situation that had developed within the Corinthian Church. The Corinthians had begun to use the Supper as means of displaying the disparity between social classes, between “strong” and “weak” believers. Paul’s treatment of the Supper develops the idea of the Eucharist as a meal of loving sacrifice of rights, elitism, ethnic, and economic differences. The meal demonstrated the Church as the Body of Christ raptured into the heavenly banquet where normal social disparities were not to be found. In addition, Paul’s emphasis on the elements as a “remembrance” of Christ and as a means to “proclaim the death of the Lord” drew his audience into a much deeper understanding of the rite. In Hebrew thought, the thing remembered comes alive to the person as a present and effective reality (Kodell, 80). Confirming the rite as a proclamation of Christ’s death meant for Paul’s audience that the ritual was a true participation in Christ, and true only if the participants had the same attitude Christ had concerning the meal. The believers must enter the celebration void of selfish ambition and fully conscious of the rite as true event of redemption. Like Paul, Mark’s account was dealing with contemporary abuses of the Eucharist. His challenge had more to do with the growing exclusion of gentiles from the Christian fellowship. Scholars have noted nuances in Mark’s feeding stories which lend credence to this claim. For example, Mark described the crowds as “sheep without a shepherd,” who had “come a long way” (8:3), including “foreigners” who if deprived of the bread might “faint on the way.” These along with other symbolic usage of the number of people fed (4000, ‘4’ being symbolic of the 4 corners of the world) and the baskets taken up (12 and 7, ‘12’ being symbolic of the Israelites and ‘7’ the number for universalism) reveal for some the teaching that Jesus’ mission is to the whole world; that the Eucharist is one bread for all people. In Mark’s Supper account the phrase “blood of the covenant” is a direct allusion to the Sinai covenant (Kodell, 91) in which the sacrificial animal blood symbolized the sharing of life (Dt 12:23). Thus, for Mark, the cup of the Last Supper contains the literal blood of the covenant in Christ. This blood of the covenant was “poured out for many” (14:24) and partaking of the cup brings the participant into solidarity with Christ and his mission. Taken together, the feeding stories and the Last Supper served to teach Mark’s audience that Jews and gentiles alike were summoned to the Eucharist, to be made one in Christ, and to share in his sacrificial ministry. Matthew writes from a slightly different angle. During Matthew’s composition the Jewish community was a weakened network of scattered synagogues led by Pharisees who insisted on strict uniformity in Jewish thought and practice. Matthew’s audience in Syria had a strong Jewish identity and thus carried a feeling of alienation and experienced internal divisions over this new sect (Christianity). Matthew’s second feeding story, unlike Mark’s, does not occur on gentile territory and there is no hint of Jesus’ universal mission. He also omits the mention of fish in the first feeding and has Jesus performing a separate blessing for the fish in the second feeding (the fish, here, symbolic of the gentiles). Matthew also emphasizes the Eucharist feeding as providing inner healing and forgiveness. 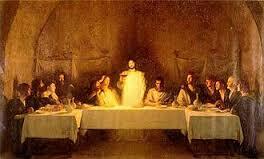 Matthew is in league with the other gospel writers in contextualizing the Last Supper in the atmosphere of betrayal. When Jesus’ prophesied his betrayal, Matthew alone adds the reaction from the disciples—“Is it I?”—to the scene, which heightens the tension. The command to “drink of it, all of you,” found exclusively in Matthew (26:27) is understood as a challenge from Christ for all who are present at the table to examine themselves, to identify whether or not they are Jesus’ betrayer, and then to drink of the covenant in Christ’s blood, “which is poured out for many for the forgiveness of sins.” This last part of the phrase—“for the forgiveness of sins”—is certainly understood in the other institution accounts, but Matthew is the only one to state it explicitly in the institution itself. The theme of forgiveness is also emphasized by Luke. This is made evident early on in the gospel during the many meal narratives. In chapter 7 Jesus confirms the forgiveness of the woman who washed his feet with her tears in the presence of his host, a Pharisee. The discussion turns to Jesus and how it is that he can forgive sins (v.49). The imagery of the setting clearly informs the reader that Jesus is willing to eat with sinners in hopes of bringing them to forgiveness—whether a Pharisee, tax collector, or harlot. Luke uses the Last Supper account to fine-tune the theme of forgiveness. The Eucharist table is presented as an open table of fellowship with Christ, offering life and salvation, to all who desire to approach. Fears of being turned away due to sin and betrayal run contrary to the whole motif of forgiveness offered to all at the table. Luke calls his audience to reflect in remembrance and imitation of the life of Christ, and to look forward with expectation of the banquet fulfilled in heaven. One final note concerning the overall result of this study is the disclosure of the fact that none of the institution accounts are given in some supposed “pure” form; each is given in the context of the Church and reveals the influence of liturgical traditions on the texts. This places the liturgy of the Church as prior to the composition of the New Testament; a point hardly worthy of mention for the 1st century audience to whom they were written, but a point easily forgotten in our contemporary experience. In many corners of Christendom today there is a sort of half-thought vision of the Church forming and developing as a direct result of the composition of the New Testament. This vision is easily routed by a cursory reading of the texts themselves, but is thoroughly refuted once one begins to study the institution of the Eucharist. The tradition of the Church shaped and informed the biblical witness long before the 27 books found their final place of honor within the canon of the Scripture. It is for this reason that the Church can submit itself to the guidance and corrective power of the word, yet still believe, as Paul did, that the “Church is the pillar and ground of the truth” (1Tim 3:15). ← Orthodox Baptism: a “Private” or “Communal” Affair?